In 1986, Richard Florida and Martin Kenney wrote a brilliant visionary research paper which was published two years later in 1988: Venture Capital, High Technology and Regional Development . The existence of well developed venture capital networks in technology-based regions significantly accelerates the pace of technological innovation and economic development in those regions. I love Miami.area. I lived in Venezuela and Miami was a natural extension of Caracas. The 500,000 Cuban immigration, mostly middle class that arrives immediately after the Cuban revolution in 1959 - transformed the area from a lethargic city of old age homes to booming metropolis. 1 in 4 people speak a mother tongue in addition to English. There is an intense effort to make Miami a High-Tech hub. I follow on tweeter Nancy Dahlberg who writes the high tech section in Miami Herald .The latest event is the eMerge conference offers more ‘proof’ Miami has future in technology . This even included eMerge Americas Techweek, Miami’s first homegrown mega-tech expo, The soul behind this idea is Manny (Manuel) Medina the founder and CEO of Terremark data center and cloud infrastructure provider - sold to Verizon in 2011 for $1.4 billion, out of which he received reportedly $83 millions as a 7% shares owner. 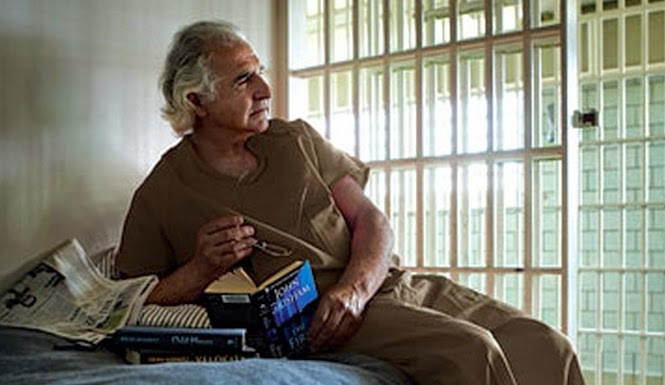 Manny story is more remarkable as he was born in Cuba and immigrated (or run away) with his parents as a 13 year old boy. Mr. Medina is realistic and knows Miami can not become a Silicon Valley over night. Endeavor Global is a fantastic non-profit co-created by Linda Rottenberg - whose book to be published in October 2014. It is titled Crazy is a compliment . The organization is a hands-on implementation of the vision of Richard Florida. Endeavor Miami covers Florida and is located in the same building as Cisneros group, one of the most efficient and high standards private family business in the world. This means a lot for Southern Florida future as a tech hub. Venture capitalists invested $9.5 billion in 951 deals in the first quarter of 2014... Dollars invested in the Software industry experienced another significant increase in Q1 2014, capturing $4.0 billion and further distancing it by more than three times from the second largest industry, Biotechnology. 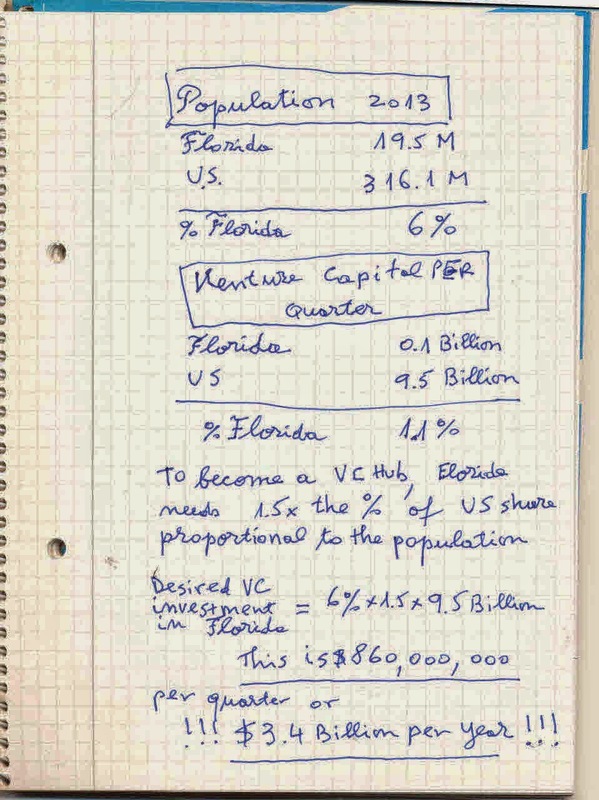 So while the US total VC investment in Q1 only is $9.5 billions , the total 2013 VC investments in Florida were $414 millions, which if we divide by 4, we have on average $105 millions per quarter. This is 1.1% , meaning 98.9% of the VC investments are outside Florida. Venture capital funding survey, first quarter 2014 is published for Bay Area California by San Jose Mercury News. The report has 25 pages and has about 300 companies listed. Two out of 300 companies, Cloudera and Hortonworks got $260 millions, which is about the total VC investment in Southern Florida for 2013. From 4 companies, only one (Ballast Point Venture Partners) invested some $ 25 ? millions in early-stage from a 200 million fund. ATV has a $ 250 millions fund, but so far they did not invest in early stage. The other two VCs have no active funds listed.. In my humble opinion there is a need for setting goals on the number of investments in start ups in Florida each quarter,then work with the other organizations (1) to create the ecosystem of investors and (2) attract candidate firms. Also liaise with Silicon Valley firms, as many venture listed have a wide range of investors., some of them undisclosed. In addition to training and attracting the entrepreneurs, there is a need to educate investors on how Venture Capitalists work.. What I mean, here is good 101 course at Stanford University, Structuring Venture Capital Investment by Trevor Loy. It will not make one a VC, but we can learn to speak a common language and create fluidity between entrepreneurs and investors. This is from 0.42 billion to 3.4 billion per year? PS: . A Tweet from Richard Florida.